I remember the day I arrived in New York City from Johannesburg, South Africa. It was 8 a.m. I had just disembarked a 16-hour flight. I had two suitcases, a faux fur coat, and a jumpy tummy. This was my new home, my new life, and I knew not a single soul. What I did have, however, was a blueprint of the way things were going to unfold for me here. My plans were naive, highly impractical, and written in ink. Since that day, I am happy to report that absolutely nothing has turned out the way I thought it would. And I have to say: I am exceptionally pleased about that. It left me with no option other than to learn how “to be able to get a little lost and then figure out the way back.” It helped me learn how to be resilient. I’ve realized that being resilient is much less about finding an impenetrable shield of invincibility than it is about cultivating ways in which to accept and adapt to your current reality; to the inevitable yet unexpected turns in the road. It isn’t about fighting for what you want to happen, but about moving through what is happening. I’ve realized that being resilient is much less about finding an impenetrable shield of invincibility than it is about cultivating ways in which to accept and adapt. And when you look at the definition of resilience, this becomes even more clear. “The definition of resilience is adapting and responding positively to stress and misfortune,” Ellen Hendriksen, Ph.D., writes in an article for Psychology Today. Resilience isn’t something we’re born with or without. It’s a skill we can acquire and sharpen at any time, and one of our main ways to do that is by practicing acceptance. Resilience isn’t something we’re born with or without. It’s a skill we can acquire and sharpen at any time. For me: Acceptance is the secret password to whisper at the door of my Resilience Party—and, I promise, it’s not as cryptic as it sounds. 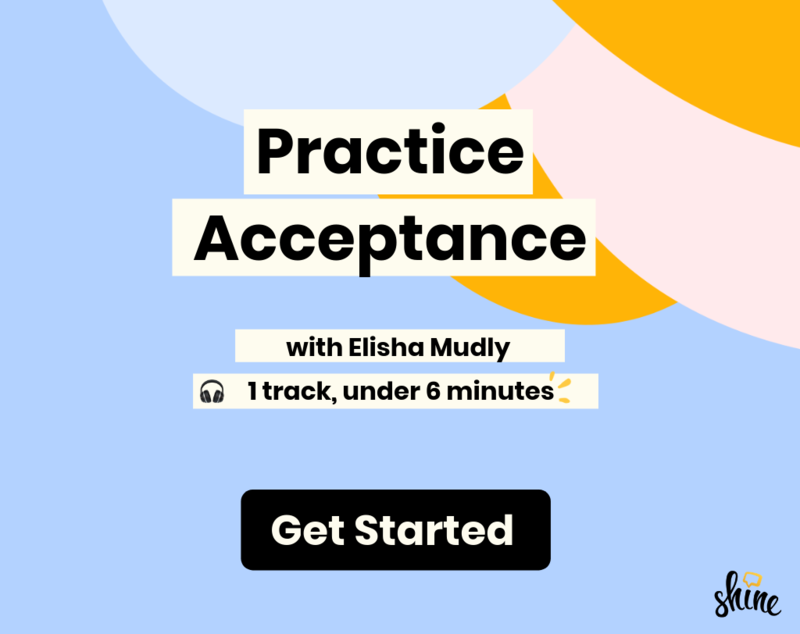 Here’s my step-by-step acceptance practice that helps me accept change and press on in the face of it. When catastrophe strikes (whether it’s life-altering big or even as small as spilling tea all over your desk), before you react take a moment to connect to your breath. Try a 4-7-8 breath: Breathe in through your nose for 4 seconds, hold for 7, then release through pursed lips for 8 seconds. There are many, many complex and potentially disappointing things in the world but just for a few seconds, all you have to do is focus on breathing in and out. If you want to accept your reality, a useful tool is wholeheartedly existing in your current reality. For a large part of the day, I find myself mentally drifting off into foreign lands. When I center myself in the present, it is far easier for me to accept my immediate world. When I center myself in the present, it is far easier for me to accept my immediate world. Fully arrive in the now by taking a moment to survey your surroundings. Notice the colors, sounds, textures, and sights around you, and challenge yourself to fully arrive. Try to watch your feelings, your state, and your thoughts from the perspective of an observer. Without judging your reactions to the situation, allow yourself to simply be there with those feelings like you would notice a different shade of color painted on a wall. Maybe the color is a little uncomfortable on the eyes, but take a minute to look at it without running to buy a new palette just yet. For me, this is the most crucial step. Acknowledge the situation and the way you feel about the situation with as much self-compassion as possible. Honor your feelings, even your unsubstantiated thoughts. Allowing them to be there does not mean you are going to act on them or that they are right. It simply means you see them. Finally, giving yourself permission to accept things is the cherry on top. In order to accept something you are deciding to let the present be, even if it does not meet your ideals or expectations. Accepting a situation doesn’t mean you’re giving up—it means you’re trusting your ability to get through. Accepting a situation doesn’t mean you’re giving up—it means you’re trusting your ability to get through. And that’s what resilience is; it means getting a little lost but then figuring out your way forward.